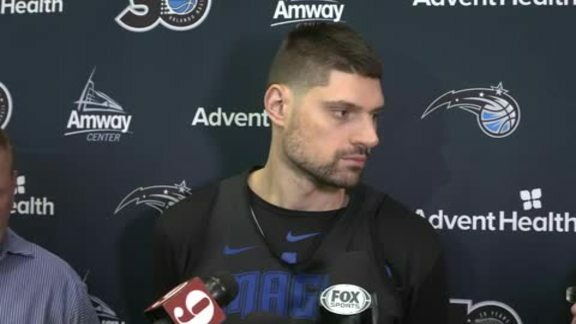 TORONTO – There is still plenty of work to be done in these playoffs and there’s great significance in his looming free agency, but Orlando Magic center Nikola Vucevic has had the kind of run over the last few months that has allowed him to realize many of his life-long dreams. In December, Vucevic and his wife, Nikoletta, welcomed the birth of their first child – a boy named Filip. In February, the 7-footer was picked to play in the first All-Star Game of his eight-year NBA career, allowing him to share the locker room and court with superstars such as his boyhood hero, Dirk Nowitzki. 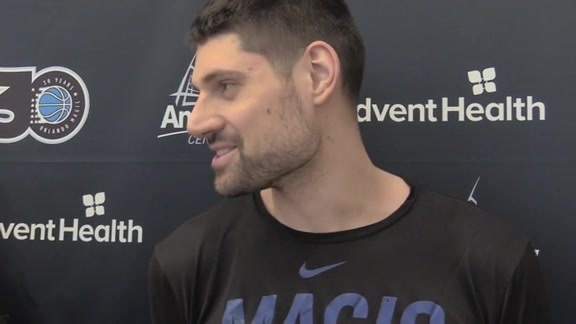 Now, after six years of painful rebuilding and struggles that tested his will, Vucevic has finally led the Magic to the playoffs – all while posting career highs in scoring (20.8), rebounding (12.0), assists (3.8), double-doubles (60) and 3-point makes (84). Vucevic looked on with great fondness recently as Miami and Dallas honored the contributions of retiring legends Dwyane Wade and Nowitzki for their contributions to those franchises. A life-long fan of European soccer, Vucevic has always admired legendary players that spent the majority of their careers with one franchise – just as Wade and Nowitzki did in the NBA. He never once asked to leave Orlando through the lean years in Orlando and he is hopeful that he will be able to stick with the Magic long term after his free agency hits in July. CLIFFORD SHORT-CHANGED: With the regular season recently wrapping up, award season is heating up just as the postseason begins. Not surprisingly, Milwaukee Bucks head coach Mike Budenholzer was the winner of the first award handed out – the Michael H. Goldberg National Basketball Coaches Association Coach of the Year award. Budenholzer’s Bucks were the NBA’s only team to win 60 games and they made a 16-win improvement over last season. What was surprising was that Magic coach Steve Clifford – the architect of the NBA’s largest win improvement at 17 more victories than last season – didn’t receive a vote for the award. It is voted on by the 30 coaches in the NBA, and Brooklyn’s Kenny Atkinson, Denver’s Mike Malone, Indiana’s Nate McMillan, San Antonio’s Gregg Popovich, Los Angeles’ Doc Rivers, Utah’s Quin Snyder and Portland’s Terry Stotts were in the ``others receiving votes’’ category, while Clifford was omitted. Orlando had the NBA’s third-best win percentage after Jan. 31, going 22-9 down the stretch. The Magic closed the season with four straight wins and victories in 11 of their final 13. That was enough to earn Clifford the NBA’s Eastern Conference Coach of the Month award for March/April. BIRCH SAW THIS COMING: While some with the Magic weren’t intrigued about the prospect of facing the star-studded Toronto Raptors in the first round of the playoffs, the matchup suits Orlando backup center Khem Birch just fine. Birch, a native of Montreal which is approximately a five-hour drive from Toronto, could not be more excited about the Magic playing Games 1 and 2 in Toronto because of the benefits for his family. Birch was hopeful that his daughter, Ariadne, who was born on Jan. 2, would get to be at the game, but that plan was nixed because of passport issues. Birch evolved into being a key cog for the Magic following rookie center Mo Bamba being shelved with a stress fracture in his left tibia. Since Feb. 2, not long after he moved into the regular rotation, Birch has quickly become one of the NBA’s best rim protectors. According to Second Spectrum Sports, he ranks fourth in the NBA in field goal percentage allowed in the restricted area (50.6 percent) among players who have contested at least 60 shots since Feb. 2. To put that into perspective, the top three are Milwaukee’s Giannis Antetokounmpo (48.6 percent), Portland 7-footer Zach Collins (48.7 percent) and reigning Defensive Player of the Year Rudy Gobert (49.7 percent). Saturday’s Game 1 is the first postseason game in the NBA that Birch has played in. However, it won’t be the first he’s seen in person. Back in Canada last spring after the magic’s disappointing season, Birch attended Games 2 of the Toronto-Cleveland second-round series. UP NEXT: Game 2 between the Magic and Raptors will be on Tuesday at 8 p.m. The game will be televised by both Fox Sports Florida and TNT. The Magic are scheduled to practice on Sunday and Monday at Scotiabank Arena and hold a light shootaround session on Tuesday morning. The practice schedule could change since there is an extended amount of time between the two games. Note: The contents of this page have not been reviewed or endorsed by the Orlando Magic. All opinions expressed by John Denton are solely his own and do not reflect the opinions of the Orlando Magic or their Basketball Operations staff, partners or sponsors.